How to recover after a manual penalty? You must know or heard of this type of penalty. This appears when a person from Google analyzes the website in cause and finds that it violates the Google anti spam regulations or the Google Guidelines. In this article we will present you a case study that developed during 6 months and through which we managed to remove such penalty. We will present you, step by step, all the actions that we have undertaken and we will tell you exactly what you have to do in order to remove the penalty. Beside algorithmic penalties, in the case of such penalty you will receive a message in Google Webmaster Tools that states that your website has been manually penalized. In this case, the penalties can be of two types: partial and complete. In the case of a partial penalty, the website is not fully affected, only a certain section of it. Above you can see an image from Google Webmaster Tools; this is the way in which Google notifies us regarding the type of the penalty. In our case it’s about a penalty that is caused by unnatural links. Keep in mind the fact that can also be many reasons of a manual penalty, like: user generated spam, thin content with little or no added value etc. There is a possibility that a website to be penalized for multiple reasons. Google can show us some links that are considered unnatural in order to have a starting point. In general, unnatural links are quite few and in our case, we have not seen more than 3 unnatural links. Remember that it is not Google’s job to inform you what spam links you have sent to a website, thus they must be identified. In the past 6 months, we have made 5 reconsideration applications – the first 4 being refused and we also made multiple updates of the disavow file. After the third attempt we found out a very interesting information, and that is that we could not send another reconsideration application sooner than 3 weeks. The website was manually penalized at the beginning of October 2013, after Penguin 2.1. The website for which we have removed the penalty has multiple subdomains, separately optimized, thus just a subdomain being affected. The steps that we will enumerate in this article are generally available for every manually penalized website. The process of cleaning the link profie is not a simple task and needs quite a lot of time because the links need to be removed manually, one by one. Once the process has started, it must be finished; if the links that caused the penalty are not fully removed, the penalty will not be removed either. It’s even harder if the number of the links is large. We will further present you every action: how we start, how we remove links, we will offer you sent email models, what to say to webmasters in order to remove the links and how to create the Disavow Links file. 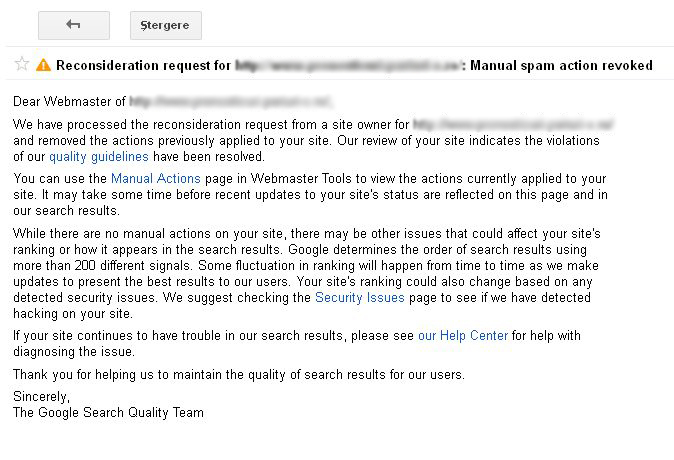 Go to Google Webmaster Tools to the section Search Traffic->Manual Actions to see what type of penalty do you have. The most penalties are due to links. Go to Google Webmaster Tools in the section Search Traffic->Links to your site and download all the files with your site’s links, all the domains that send links to your website and the file with anchor texts. This is the most important step because you need to know all the links and domains that send links to your website. It’s essential to see what anchor texts predominate because it is very possible that they may be another reason for which your website was penalized. As a first advice we recommend you not to use just Google Webmaster Tools because it does not offer all the links that refer to your website. At export, at Linking domains, they only show you the first 1000. In the links section you can export more. We have made the first exports from Google Webmaster Tools at the end of November 2013, we have exported 312 linking root domains and 1228 links. A part of them were side-wide (blogroll/footer). All these are the easiest to remove. It’s very important to use not only the information from Google Webmaster Tools because there are not presented all the links, although Google tells only to focus on those links. A very good links index can be found at Majestic. We used all the information from Google Webmaster Tools, MajesticSEO and OpenSiteExplorer. We have compiled one list with each and we’ve removed the duplicate links. We had done this after the first reconsideration application was rejected. All domains were manually analyzed, because we were certain of this type of analysis. It’s very easy to identify a spam link. Step two it’s the most important because you need to be very organized with the links that you have analyzed, with the ones you have removed and with the ones you haven’t. Here, Excel, can be your friend. Organizing is crucial because you will never know how much the process takes and you don’t want to get confused in the links lists. Moreover, if there are multiple links you will not be able to analyze them the same day. Below is a model that you can use in order to better organize yourself. This model has informative character for a few types of links. If you want, you can take out other pieces of information regarding links, like DA, PA, Citation Flow, Trust Flow, just to organize them even better. After you have extracted all the links (step 2), you must now extract the contact information for every website. There will be many websites in which you won’t find contact information. What can you do in this case? If there’s a blog, search for the blogger’s name (pro tip: verify the comments from older posts). After you have found it, go and search their name in Facebook, it is very likely that you may find him. Use advanced searches in Google Search, like: site:blog.com [email protected], site:blog.com “contact”, site:blog.com [email protected] etc. Here you can be creative. Use advanced searches in Google Search, like: site:phone prefix in order to find phone numbers. At blogspot.com look for the Blogger Profile widget because there you can find email addresses. Look at article comments and see what are the most recent ones, because there can be the possibility that the blog to be very old and inactive and the email addresses to not be valid anymore. You can leave comments to the posts, because, in general, the webmaster receives an email notification. The easiest and most efficient way to contact someone is by email. To be sure that the emails sent by you will be opened, we recommend you a very useful plugin, Yesware, that you can use with Gmail. This will show you what emails you have sent and which of them have been opened. Our opening rates were very high: we’ve sent over 120 emails from 3 different email addresses and we managed to remove 73 articles. The majority of the articles were removed and only a small part decided to remove the links from them. For the websites that we did not find the email addresses, we’ve contacted them through Facebook (personal profiles or fan pages), by telephone (where there could be found) and Google+. It was a very beautiful process because every one of us worked, as a team, and the link lists were analyzed by many SEO consultants. The mail must be short and to the point. Possible subject for your email: Link for site.com to be removed, article about site.com to be removed. My name is Daniel Ene and I’m contacting you in the name of site.com. Unfortunately, our website got penalized by Google and we wish to ask you to remove the link from the footer that refers to our website. We’re waiting for your answer. The email from above is very impersonal. My name is Daniel Ene and I’m managing site.com. Unfortunately, the website got penalized in November 2013. There is an article on your blog from 2011: http://blog.com/article-about-site.com. Can you remove it or remove the links that refer to our website? We think that the links from the article are a reason for our penalty. This email is personal and has better results. 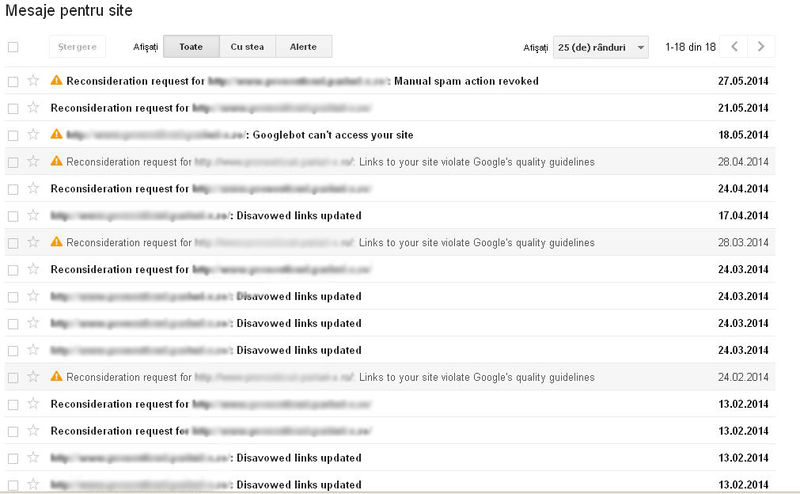 If you have been manually penalized, it won’t be enough to add the harmful links in the disavow file. You must show, with actual data, your will to manually remove the links. The disavow file is very easy to create, you must follow the Google guide. 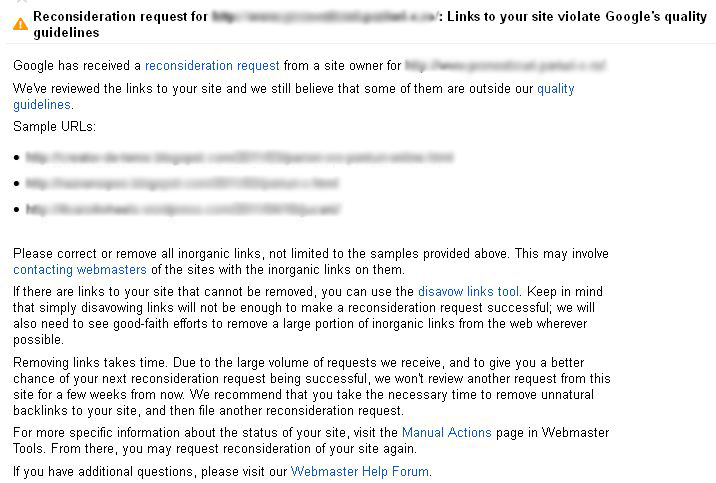 In disavow you add links that couldn’t be manually removed and that are extremely harmful. If you are not sure if a link is harmful or not, then do not add it in disavow. We emphasized the domain removal and not only links pages because we’ve found out that there were cases when links were still not removed. For example: a tag page on a wordpress website, an indexed RSS page, an archive page or a pagination page. The easiest way to add the domain is to be sure that you will not be receiving links from them anymore. For every link we recommend adding a comment. We divided the links that we haven’t removed on multiple categories: without contact data and without answers. The comments can be added with “#” before. The file must be .txt. We’ve added in this file over 130 web domains. We don’t think that is a general available rule regarding how many domains are better to be or not to be added. If the domains are harmful then they must be removed. The reconsideration request is the letter addressed to Google in which you admit your mistake. There are a few aspects that you must have in mind in formulating the reconsideration request. Keep in mind the maximum number of characters from the application, it must not exceed 5000 words, because you will receive an error. Behind every reconsideration application there is a person that you must respect. Further we will show you print screens from Google Analytics and from Google Webmasters Tools. In the period of October 2013-June 2014 there were not link referrings build to the website. Keeping in mind that we have removed a lot of links – links that helped our ranking, the traffic started to recover. Very important is that, although we’ve removed those links, the positions for keywords managed to recover. That page is optimized on 6 words and all are positioned on 1 and 2 in Google Search. Below are answers for two of our reconsideration applications. If there are not accepted, you will receive pieces of information with examples of spam links. Below is the message that stated that the manual penalty was removed and the messages for the websites. The penalty was removed on 27.05.2014, at only 6 days after we have made the last reconsideration request. The answering duration from the moment in which you sent the request until you get an actual answer is approximately 7 to 14 days. talking about online. You certainly know how to bring a problem to light and make it important.